The Society for Peace Unity and Human Rights for Sri Lanka (SPUR) views with great concern the provocative, divisive and duplicitous statements made by Mr R. Sampanthan, the Leader of the Ilankai Tamil Arasu Kadchi (ITAK) at its 14th National Convention recently held in Batticaloa. While masquerading under the English name ‘Federal Party’, ITAK which translates to ‘Ilankai Thamil Arasu Katchi’ or ‘Lanka Tamil State Party’, has been a chief contributor to the divisive ethnic politics that have plagued Sri Lanka for many decades. This is clearly illustrated by Mr Sampanthan’s own boast that the ITAK ‘was created by S.J.V. Chelvanayagam, the father of Tamil Nation, for the purpose of establishing self determination of the Tamil people on this island. This objective is evident in both the name of the party and in the manner in which it operates’. Mr Sampanthan admits that the Tamil United Liberation Front, of which his party was a member, ‘took the historical decision to establish the separate government of Tamil Eelam in 1976’. However his claim that ‘Based on this decision of our party, and the need to place ourselves in a position of strength, Tamil youth decided to oppose violence with violence and began to rise up as armed rebel groups’ is utterly misleading because the infamous ‘Vaddukoddai Resolution’ adopted in 1976 under the chairmanship of ITAK founder Chelvanayakam calls for the ‘Tamil Nation in general and the Tamil youth in particular to come forward to throw themselves fully into the sacred fight for freedom and to flinch not till the goal of a sovereign state of Tamil Eelam is reached’. He also speaks of an ITAK ‘which does not have any history of armed struggle, which has always rejected such struggle’. However, the TNA / ITAK not only endorsed the Liberation Tigers of Tamil Eelam (LTTE) as the ‘sole representatives of the Tamil People’ but directly benefitted from the violence perpetrated by the LTTE on Tamil political opponents. In particular, the Sri Lankan General Elections of 2004 saw unprecedented vote rigging by the LTTE in favour of TNA/ITAK candidates, a fact widely reported by international monitors and rival Tamil Parties. The ITAK never condemned the LTTE for its terrorism, ethnic cleansing, Tamil child conscription, extortion from Tamils people and the holding Tamil civilians as ‘Human Shields’ against the advancing Sri Lankan Security forces. This was left to other Tamil political parties, Human Rights Groups as well as Sinhala and Muslim communities or organisations. Ironically, the LTTE assassinated a number ITAK Leaders, but the party remained a captive of the LTTE. A possible explanation lies in Sampanthan’s statement that refers to the elimination of the LTTE as ‘the destruction of their bargaining might’. Mr Sampanthan further states that the ITAK does not ‘consider the 13th Amendment to be an acceptable solution’ and that they have not given up their rights ‘under international law to external self determination’. He also says ‘The softening of our stance concerning certain issues, and the compromise we show in other issues, are diplomatic strategies to ensure that we do not alienate the international community. They are not indications that we have abandoned our fundamental objectives’. This is a form of deception similar to the ‘Little Now, More Later’ policy for separatism of S.J.V. Chelvanayagam which makes any nation building discussions with the ITAK and similar race based political parties such as the Tamil National Alliance (TNA) a totally unproductive exercise. 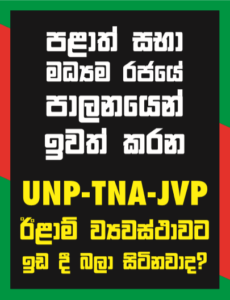 It is also necessary to examine TNA/IATK agenda in relation to the Constitution of Sri Lanka. Mr Sampanthan attempts to entice the Eastern Muslims into supporting the opportunistically concocted entity of a ‘Tamil speaking people’ with claims that the ‘North and East of Sri Lanka are the areas of historical habitation of the Tamil speaking people’, ignoring the fact that the ITAK endorsed LTTE carried out brutal massacres and ethnic cleansing of Sinhala and Muslim communities in these very parts of Sri Lanka. While Mr Sampanthan’s speech may encourage extreme elements in the Tamil community and the foreign based LTTE fronts which still harbour dreams of reviving the LTTE, their plans will be strongly opposed by Sri Lankans of all ethnic and religious backgrounds who have already experienced separatist terrorism for nearly three decades. SPUR strongly believes that economic development, reconstruction, the enshrining of individual rights, good governance and equitable opportunities for all its people, rather than subdivision into ethnic territorial units, should be the basis addressing any issues faced by Sri Lanka.